I remember being in the mall in the beginning of October and seeing a sign in Macy’s advertising that they were taking applications for seasonal workers. The holidays offer one of the biggest hiring surges of the year. Here are some quick tips to maximize your holiday hiring this season. The best time to start was yesterday, but since we don’t have a DeLorean, the second-best time is right now. Right this second. Start advertising those openings today! This is a super simple way to hire for the holidays. Aneasy appeal to hiring customers? Offer them an employee discount. They already love your products so they’ll be a huge asset. They’ll be able to sell your product while more than likely spending their money with you as well. going to leave in January and probably won’t be returning next year. Meaning, you need to spend money training and training and training each new batch of millennials. Many retirees would love a job. They’re not interested in partying it up with their friends from high school and probably have a more flexible schedule. Plus, they already have valuable knowledge and training! If you treat them well, they could be a great asset to your company. When your employees have a friend at work, things are more enjoyable. Happier employees mean everyone is happier. Back when I was a waiting tables in college, I worked with my best friend. We pushed each other to hustle while also enjoying ourselves. Never once did we call off of a shift we had together. We were also more likely to pick up shifts if the other one was working. Plus, when you ask your employees, you cut down on new hire costs. Everyone wins. It’s the holidays. Bring in someone chipper. No one wants to deal with a south pole elf when they’re trying to do their holiday shopping. A superstar personality means that everyone wins. 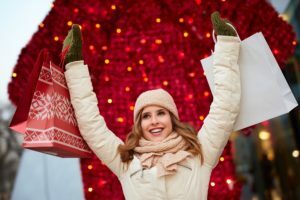 We hope these tips help you to really maximize your business this holiday season. With a great staff and low cost of acquiring that staff, everyone wins this Christmas. Small Business Funding is the nation's premier business advance marketplace. We are the single point of contact with access to multiple funding offers.